It’s Significantly Less Expensive: It is generally about a quarter of the cost of typical legal fees incurred in a standard divorce. It Gives YOU Control: You decide what’s best for you, rather than a judge (a complete stranger). It’s Civil: Divorce mediation relies on parties being respectful for the purpose of efficiently working through their divorce. It’s Private:When a divorce is litigated, it is commonly heard in open court. With mediation, privacy is fully preserved; parties will work through their issues and the details of their divorce behind closed doors. It Fosters a Better Future: Mediation is a civil process designed to promote a more dignified end, whereby future encounters between the parties are likely to be healthier as well. Ann LoDolce is a trained and experienced Lawyer-Mediator. Ann is a well-known and highly respected mediator. In her mediation practice, Ann acts as a neutral person who does not represent either party. It is her job to act as a facilitator in assisting the divorcing parties to reach an agreement on the terms of their divorce. As the mediator, Ann carefully prepares a “letter of understanding” after every session. This letter of understanding summarizes the extent of any and all agreements reached. Letters of understanding can easily lead to a mutually satisfactory divorce agreement at far less cost while retaining total privacy. And the settlement is accomplished without public hearing or open court record. With mediation costs and expenses are substantially reduced . Litigation invites conflict. And it is, by its very nature, confrontational, painful, and very expensive. Mediation, on the other hand, is a voluntary process by which two people in a divorce dispute meet with an impartial third party to arrive at an informed, mutually agreed to settlement. 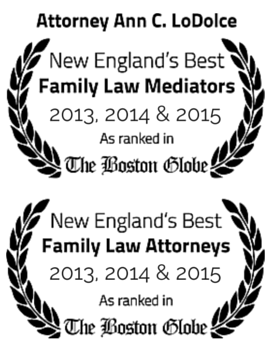 Mediation is, by far, the most cost effective way to settle disputes between divorcing parties. Interest based negotiation enables clients to discover common goals for their family and to work towards a resolution that addresses everyone’s needs. The mediation process can encourage empathy, and an understanding that more interests are shared than realized and an appreciation that parties will be connected one way or another well into the future. What if the mediation breaks down? It is important to note that even if the mediation process is subsequently abandoned, the agreements reached by the parties during the mediation process will generally provide the basis to the final agreement.